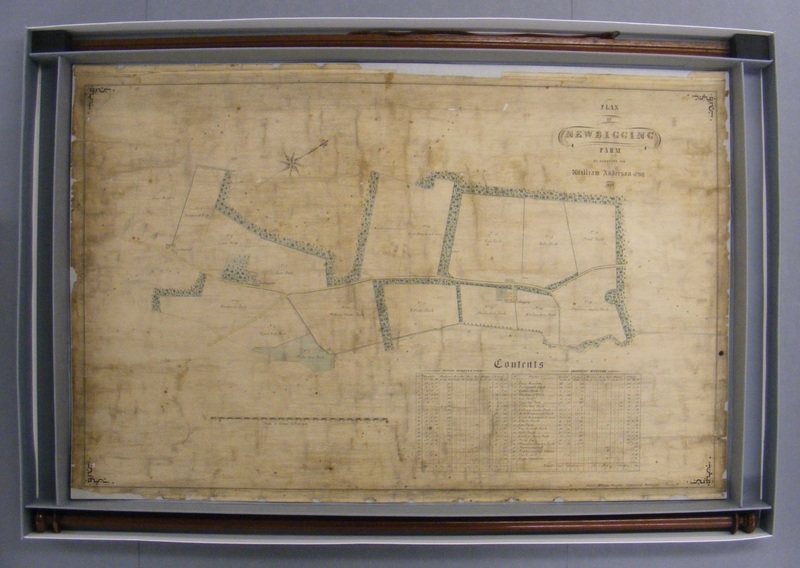 Lynn Teggart from the Library’s Conservation Unit recently treated two maps from the collection donated by Bartholomew, the Edinburgh-based firm of map engravers, printers and publishers. This map dates from 1864. These fields, near Penicuik south of Edinburgh still appear to exist. The map is printed on heavyweight, woven paper; colour has been added by hand with water colour paints, and a layer of varnish applied. 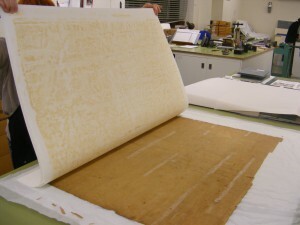 The paper has been lined onto a linen support, and wooden rollers are nailed to the upper and lower edges. 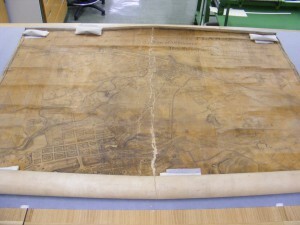 The map was prioritized for treatment because it was in very poor condition. Several large tears severely distorted the surface. The paper and linen layers were separating, and the map was extremely dirty: the varnish layer had yellowed, obscuring the detail. A range of options for treatment were considered, from the minimal – surface cleaning and re-housing – to the more invasive. We decided on full treatment: removing the linen support and the varnish layer, washing and de-acidification of the map, and re-lining with Japanese tissue. This was considered necessary to avoid further damage in the future and to allow the map to be handled safely. 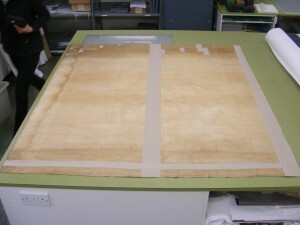 The treatment involved testing to find a way of removing the varnish successfully, and to identify a suitable lining paper. However, the end result was a stable and robust map, whose appearance was dramatically improved. The second map, Edinburgh and its Environs, is dated 1817. Its construction is similar to the Newbigging Farm map. 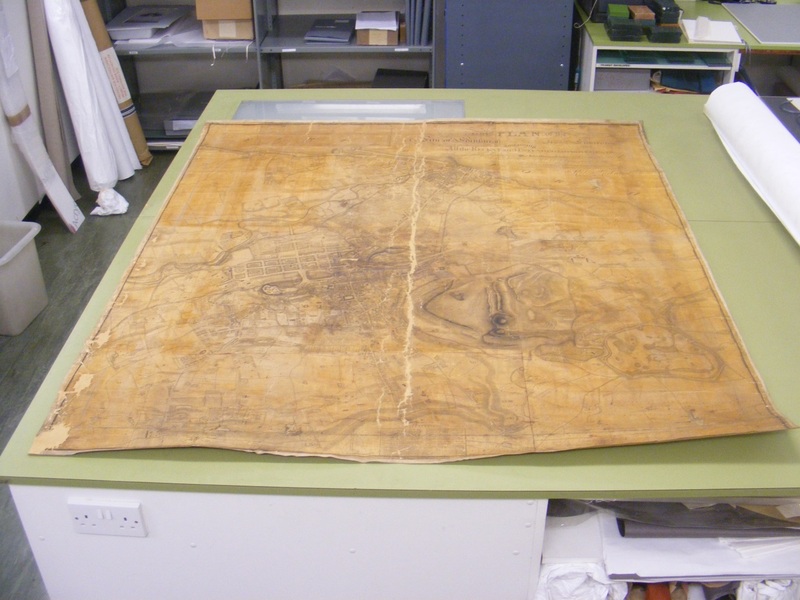 The aims of the treatment were to stabilise the map and allow it to be safely consulted, as well as to protect it from damage whilst in storage. It was part of a large group of maps all requiring similar attention, so the treatment method had to be quick enough to allow equal treatment to all. The condition of the map was again fairly poor: it had a central area of loss where it had been folded, and the layers were fragmentary and flaking. The linen backing was weak and dirty; the varnish had discoloured to an unpleasant orange-brown. On this occasion a fairly minimalist treatment was chosen. 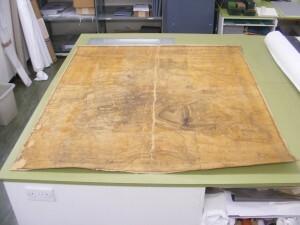 The varnish layer and linen backing were retained, and the map was dry cleaned with a chemical sponge rather than washed with water. The reverse of the map was strengthened using strips of aerolinen, which is an extremely strong textile developed for the aviation industry. Loose fragments of the upper surface of the map were readhered to the backing and losses in the paper layer were infilled. The map was too large to store flat, so it was rolled around an extra wide roller and placed inside a cube tube box. Following treatment the map was relatively stable and much less vulnerable to accidental damage than previously. 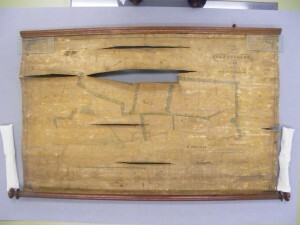 However, the surface was still at risk of flaking because the varnish was still in place, and the appearance of the map had not been transformed to the same extent as for the Newbigging Farm map. 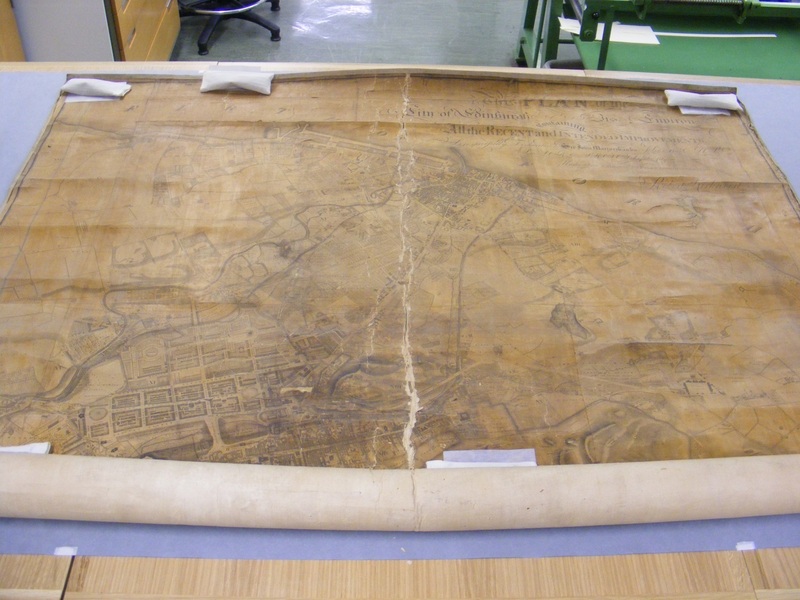 These case studies show some of the treatment options available for large maps, and demonstrate the challenging decisions that have to be made in order to care for the Library’s collections in their entirety. The principles at the heart of every conservation intervention are reversibility and retreatability, which ensure that we can always return to an object in the future if circumstances change.